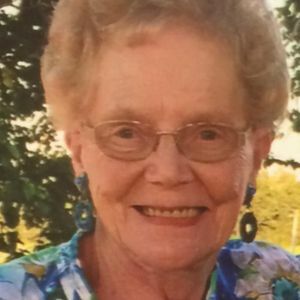 Lois Moore of Owensboro, passed away on Sunday, March 24, 2019 at Hermitage Care and Rehabilitation Center. She was born in Owensboro to the late Gilbert Pate and Marie Pate Bittel. Lois was retired from the Owensboro Public School System where she served as a cafeteria worker. She enjoyed dancing at the V.F.W. and the Elizabeth Munday Senior Center. She was an avid U.K. basketball fan, loved reading, and especially loved spending time with her grandchildren and great grandchildren. Lois was also preceded in death by her husband, Roy "Wig" Moore, her son-in-law, Nathan Mock, two brothers, Melvin Pate and Gilbert Pate, Jr., her step-father, Paul Bittel, and a close friend, Rachel Keelin. Surviving are her children, sons Jerry Moore and wife Ann and Larry Moore and wife Charlotte, and her daughter, Linda Mock, all of Owensboro, six grandchildren, Jerry Moore, Jr., Michelle Mayfield and husband James, Lori Davis, Michael Moore and wife Maureen, Mark Moore and wife Julie, all of Owensboro, and Carol Grant and husband Kevin of Utica, 14 great grandchildren, a sister, Frances Millay and husband Ronnie of Owensboro, two brothers, Carl Bittel and wife Barbara of Rockport, Indiana, and Delbert Bittel and wife Kay of Owensboro, and several nieces and nephews. The Funeral Service for Lois Moore will be Noon Thursday, March 28, at Glenn Funeral Home and Crematory. Burial will follow in Elmwood Cemetery. Visitation will be from 3:00-7:00 P.M. Wednesday and from 10:00 A.M. until Noon Thursday at the funeral home. Memorial contributions may be made to the Owensboro Public School's Foundation for Excellence, 450 Griffith Avenue, Owensboro, KY 42301. Memories and condolences for the family of Lois Moore can be shared at www.glenncares.com.